Newly elected Louisiana Congressman Vance McAllister said the endorsement by the Duck Dynasty fame might have given him a leg up in winning Saturday’s runoff for an open congressional seat. “When Willie and Jep and Jase did what they did for me, I’m sure it didn’t hurt at all,” Republican Vance McAllister told Fox & Friends Monday, referring to the endorsements he received from the folks on the popular TV reality show. Vance McAllister beat fellow Republican state Senator Neil Riser in a runoff election for the seat in the state’s 5th Congressional District. Both self-described conservatives, Riser ran on the endorsement of the Tea Party of Louisiana. 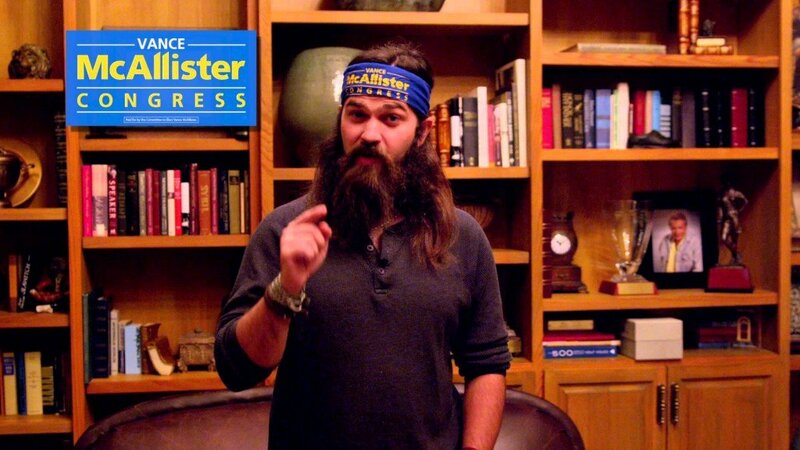 Phil Robertson endorsed Vance McAllister, a businessman and political newcomer, because he had “the least political experience,” Raw Story reports. “We had just wrapped up with all my TV interviews and everything, and I was talking to some friends and family. And, next thing I hear is, <<Willie is here.>> And, I turned around and, oh, my goodness, it’s like Grizzly Adams walking up behind you,” Vance McAllister said. “He told me he was proud of me. And, I told him, <<Well, boy, I appreciate it>>. Phil, Jase, and Willie and Jep, and even Si, they are amazing, true Christians,” Vance McAllister added. Vance McAllister also said the barrage of negative campaign ads against him also contributed to his win. “It was 100 percent negative campaign against 100 percent positive campaign. And, I stayed true to my faith and maintained my integrity,” he said.